So today is technically halloween, but that’s not something I’m really into so sorry if people were expecting some kind of halloween thingy. I’m just not that into it. It is also the night before NaNo, so there’s all that I’ve got to worry about too so I’m busy with last minute preparations. On top of all that my good friend Brandon is still in the process of fighting cancer (doing a second round of chemo currently) and I think, given the day and the fact I have no review written, it would be good to mention his awesome set of books. 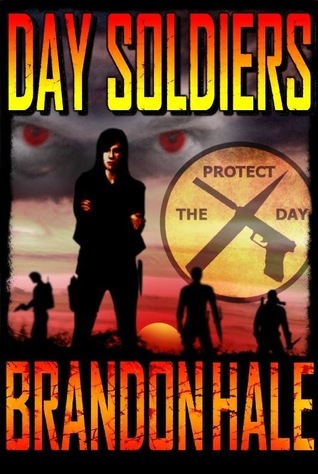 Firstly there’s the Day soldiers series which is about vampires, but a bit more of a traditional viewpoint on them, as in they’re evil and humanity is fighting against them. 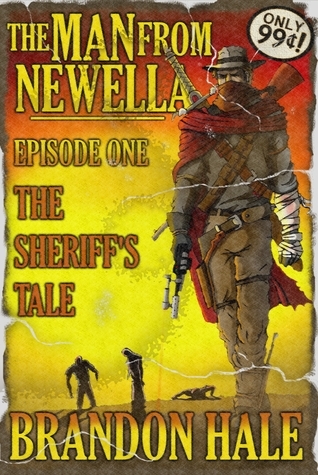 If you like action books with plenty of fast pacing and life or death situations it’s a great book to read and it’s also free to grab right now, on amazon.com, amazon.co.uk and all the other major ebook retailers. 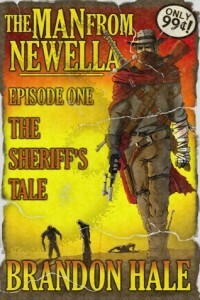 Brandon also happens to be really good at the cowboy sort of stuff and has a brilliant series of cowboy futuristic dystopian novellas in the Man from Newella series. You can get that on Amazon.com and Amazon.co.uk too. It’s only 77p or 99cents. The books is finally available, and if you were one of the people who pre-ordered it then it probably appeared on your devices sometime around midnight. It seems like it’s been quite a ride with these characters and I’m a little sad to have finished the third book but I’ve always made it a rule not to write sequels just for the sake of sequels so until my brain can figure out what more might happen in Sherdan and Anya’s world that’s the trilogy wrapped up. 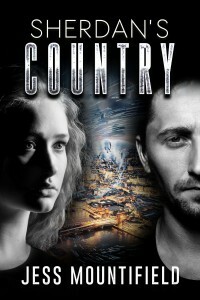 Sherdan’s Country concludes the beginnings of Utopia and continues the fast paced action and emotion fuelled politics around the new country and its leader, so if you’ve not grabbed a copy yet and want to find out what happens you can do so at all the major ebook sellers – Amazon, Apple, Barnes & Noble, and Smashwords. It seems I’m coming up to (and in one case I’ve passed) some big anniversary markers in my life. Most people have a lot of changes in their life around the age of 18 so I’m sure I’m not the only person who finds at 28 that the last ten years has been quite a ride. Like others I went off to university and just over ten years ago on October 5th 2004 I turned up in Bath ready to study and meet new people. One of the first people I met was my now husband, Phil (yes I did declare my undying love to the first guy I met at University and yes I’m aware you’re not meant to do this) although it’s still quite a few weeks away from the anniversary of us getting together as a couple. While I was getting to know Phil he invited me to go along with him to church and I couldn’t see any reason to object to the idea so off I went with him. It was quite an experience. Within minutes of the service starting I found myself overwhelmed with the feeling of being safe and peaceful, something I hadn’t felt in years for one reason or another (I didn’t come from the most stable of family backgrounds and despite my mother’s best attempts to make our family life safe and carefree I was a little too good at getting myself into trouble), and on the 26th October 2004 I decided I was going to try to follow Jesus and the things he taught. That makes it my tenth birthday this Sunday. I later discovered that the same feeling of safety came back every time I worshiped. Shortly after that I went to Freedom Bath and Bristol, one of the churches in Bath, and accompanying the feeling of safety I got every time I reached out to God, I also felt very much at home. There’s never been one person specifically or one event or moment. I just walked into Freedom on November 13th 2004 and knew I was home, and almost ten years later it’s still the same. Every time I walk in I know it’s where I belong. That feeling and concept often comes up in the stories I write and I know it’s because I get to feel that sense of belonging each and every week. Within my ten years at Freedom I’ve also seen some pretty awesome things. I’ve personally been healed twice. The first time my right leg grew by about 2 inches (it was shorter than my right and had been causing back problems, including scoliosis), and the second time I was healed of some internal bleeding which I blogged about already here. I’ve had several financial miracles where money has turned up right when I needed it, once so I could quit the day job and start my writing career, and another time so my husband and I could buy our first house. Being in Freedom has also meant I’ve had great teaching from the leaders, I’ve been supported, encouraged and often inspired as a writer and part of the creative community within the church, and I’ve had plenty of mentors, friends and people to do life with. I am so much more emotionally stable and have a greater understanding of who I am, what makes me me and what I want to do with my life than I ever have before. Bad stuff still happens occasionally, but it helps to know I’m not alone in facing it, unlike how I used to feel before I came to Bath. I’m definitely looking forward to the next ten years with God, Church, my husband and my friends. 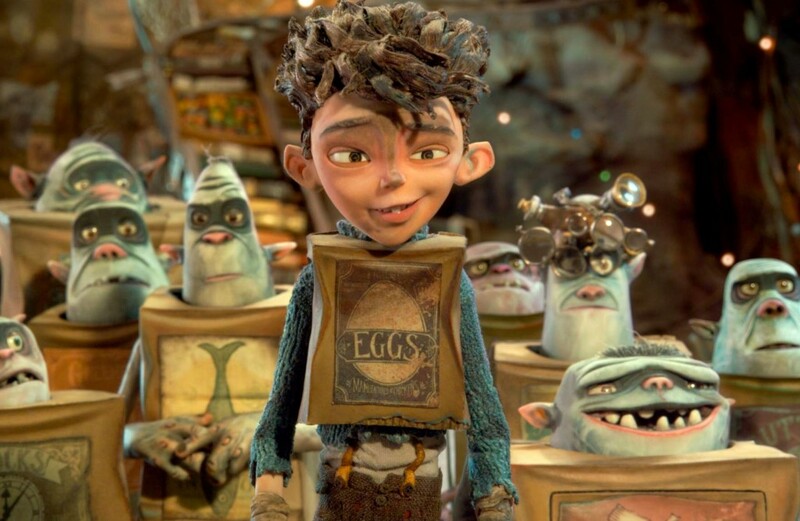 This is one of those kids films that just looked too cute to ignore but I thought I’d missed it as it ws hyped majorly several months ago but then things seemed to go quiet for a while. It was done in stop motion, I think or at the least animated to look that way and was very nicely styled. There was also quite a number of famous voices, especially of the side characters and henchmen (and really they had most of the best lines from an aduly perspective). This was definitely one of those kids films that felt possibly like it was even more for the adults than the kids. There was the fairly standard kids theme, this one was who you are on the outside and what society thinks you are doesn’t mean that’s what you are on the inside. Also that you can change and become more than you were before, but shouldn’t do anything for the acceptance of others. 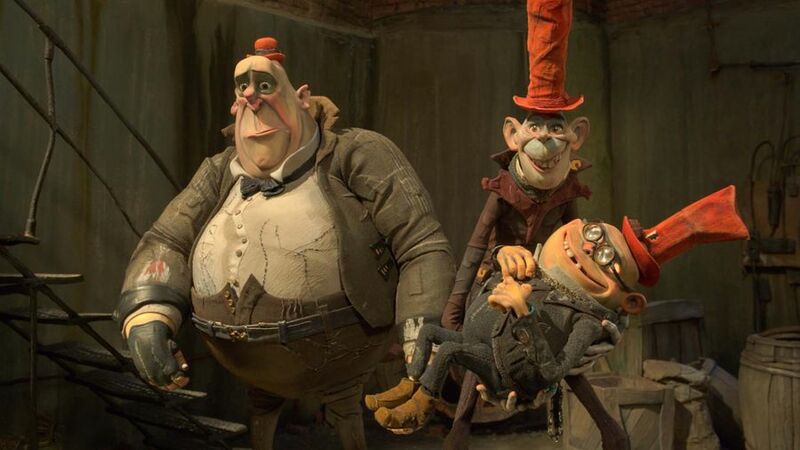 I laughed aloud quite a bit so the film definitely scored well from the comedy side, mostly because of the side characters and henchmen as I said earlier, but I did find the boxtroll snatcher to be quite scary. From an adult perspective probably not that bad, but if I was a child I think I’d have found it a little too scary so please be wary with the younger ones. All in all it was a reasonable adult version of a kids film that made me laugh but I don’t think it was as good as frozen or tangled let alone the lego movie. A big part of being a story teller is experiencing stories and adventures, learning about other cultures and meeting new people. All of those experiences go into one big melting pot along with all the books and films to merge together and mix themselves up until the original sources of each part are barely recognisable. While I spend about 48-50 weeks of the year splurging out these ideas and my thoughts on characters of all shapes and sizes it means there’s a few weeks left where I do the opposite and go experience for myself. 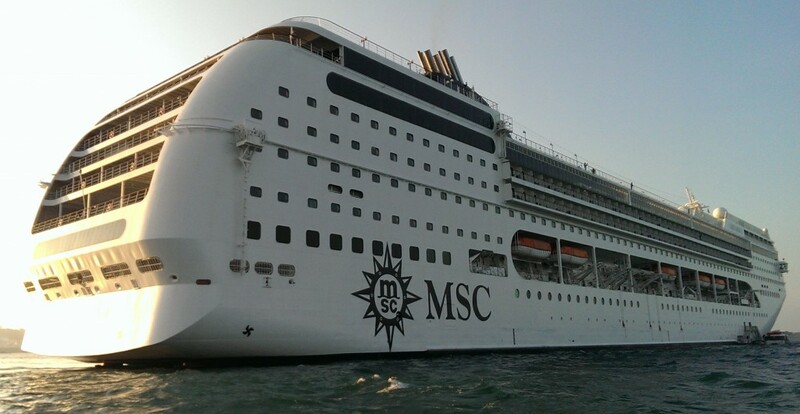 This year my fella and I had the new experience of a cruise, and here’s the ship we called home for a while (<—-) the MSC Opera. (this photo was taken from aboard one of the lifeboat/tender’s the main ship carried, just outside St Peter Port on Guernsey). Our cabin was one somewhere near the middle of the ship in that row of windows just above the lifeboats on the side. We had an outside cabin but not a balcony room as they were a little out of our price range. 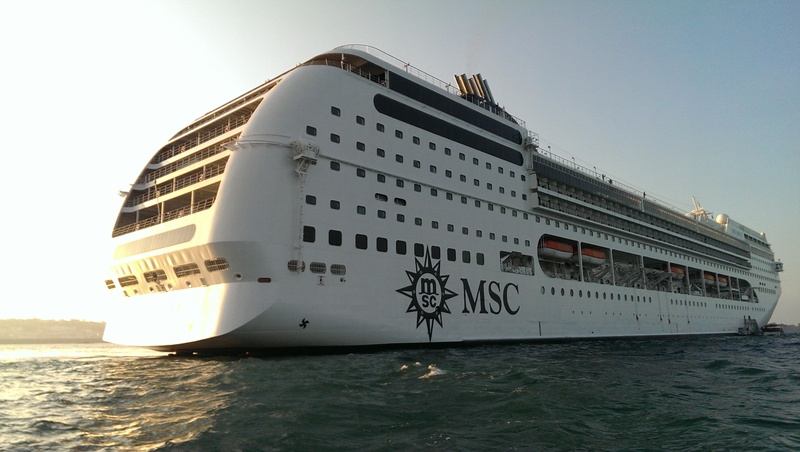 As this is the first cruise I was on, I didn’t really know what to expect but my cabin was reasonable and very clean and tidy. 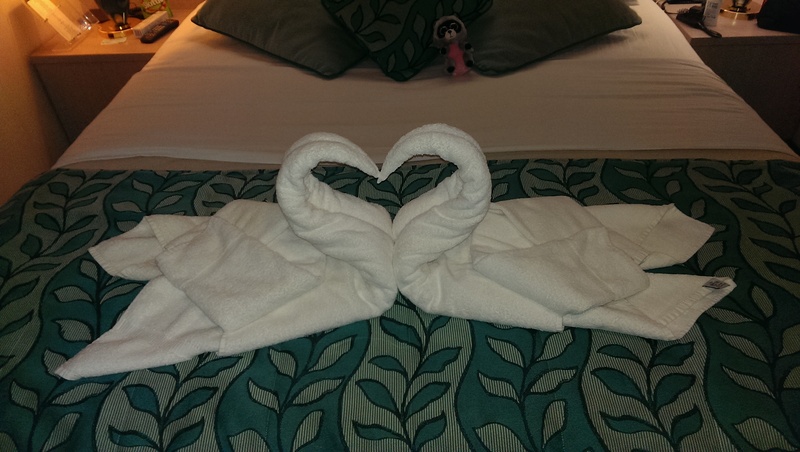 It also regularly came with a sort of towel origami and we couldn’t help but take a picture of the cuteness. This is just one of the many examples of the way the staff tried to make things that little bit special. Our waitor at dinner was lovely (as was the head waiter, who handled my allergies) and we met some great people who shared our table of eight every evening. I think it helped to make the evenings the part of the day I looked forward to most. Getting to know new people is always something I enjoy and we had a brilliant set of couples to talk to over dinner. Dinner was almost always followed by the evening show, which was another highlight for me. On the first night a very talented male singer faultlessly sung his way through Music of the Night from Phantom of the Opera, possibly one of my favourite songs ever, and a few days later did a rendition of Nessun Dorma that had my arms break out in goosebumps. On top of that there was flamenco and some great classical pieces from a whole array of talented entertainers. If the cruise’s entertainment wasn’t enough there was also excursions most days, and it really did feel like these were just extras. There was so much going on already that you could have stayed on the boat if you wanted and not gone to see the cities on the ship’s tour. They felt a lot like the icing on the cake rather than to main event. although of themselves they were still great too, and visitng so many places meant there was always a little something to find every day. 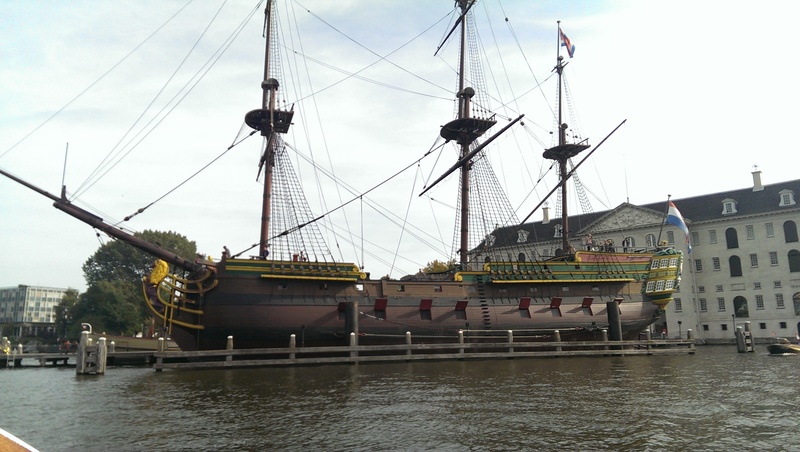 Above to the left is a photo of a replica Dutch galleon recreated by the homeless and unemployed in Amsterdam. 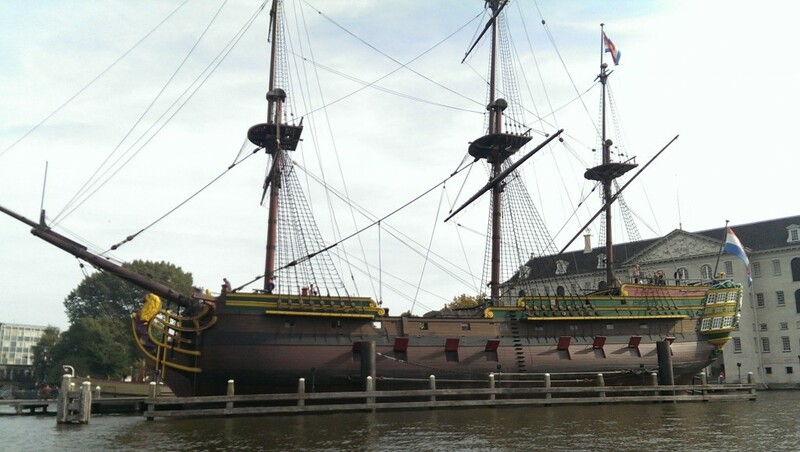 I didn’t know whether to be more excited that it was an old ship or that they’d given the task to people who needed it most, but it was the first of many discoveries and moments that made the holiday special. No holiday of mine is complete without at least one castle, but in 7 trips ashore, I managed to find a castle and two hillforts. 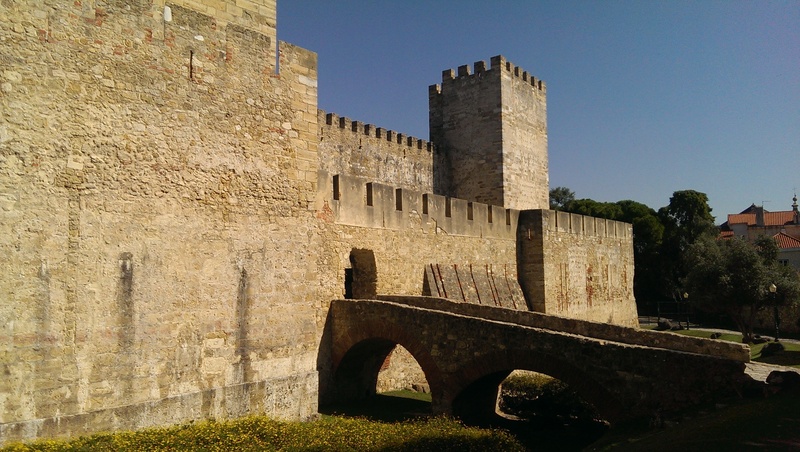 The picture to the right is St George’s Castle in Lisbon and was still quite intact considering how old some parts of it where. While we were in Lisbon it got up to 29c so we were very glad to find a few shady courtyards inside, but we also clambered all over the walls, finding ourselves allowed up some very tiny staircases that would definitely have been shut off if the castle was in the UK for health and safety reasons. 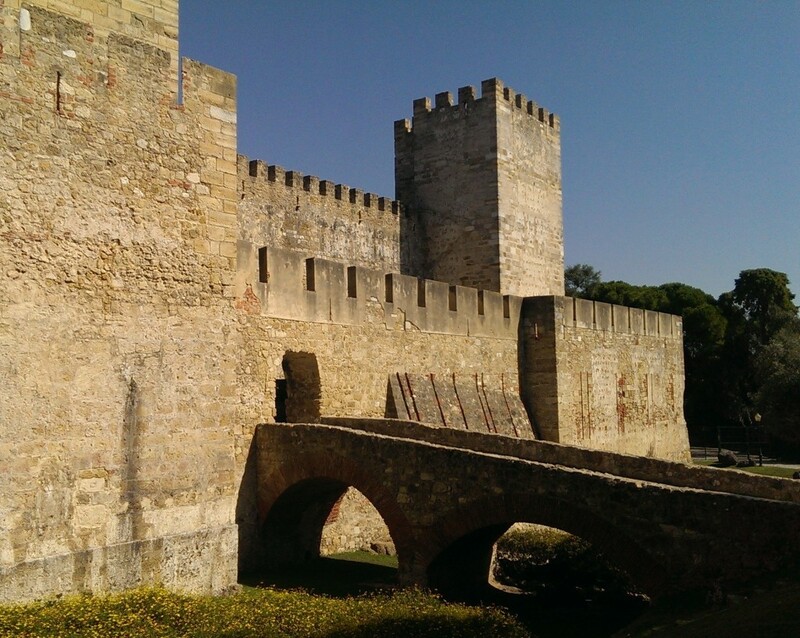 In Spain a very pleasant chap explained lots of the local history of the hill fort (Castello) in Vigo and several naval battles that had happened in the nearby bay. This led to the very fortunate realisation that I knew of the naval battle because I’d studied it at some point and was getting to actually see the location it happened it. Always a fun thing to discover. Finally no adventure on foreign soil would be complete without taking in the views from at least a few places, so here’s one of the better photos. 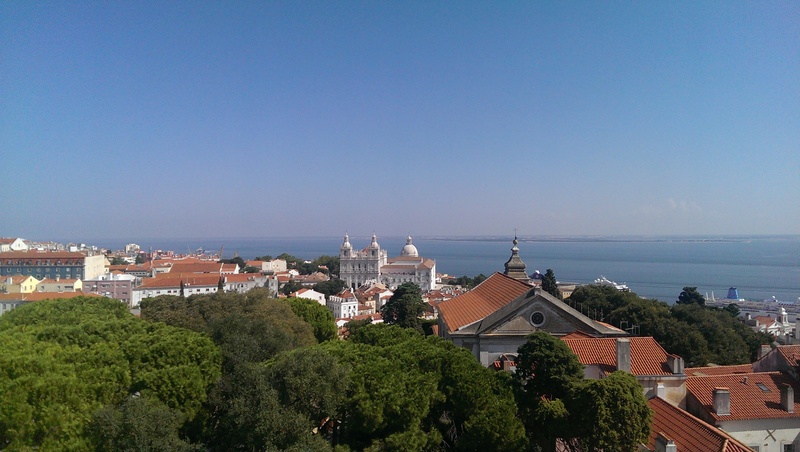 It was taken from one of the highest points in Lisbon after walking all the way up there (we wanted to take the tram but found ourselves almost there before we’d figured the tram system out). There was also the few cases of having to point at drinks and menu items in cafes and pubs to communicate with the local staff when they didn’t speak English and our Spanish was sadly lacking. Although we did end well, managing to communicate with our french waitress in Le Havre well enough to order the right quantity of chips and drinks for our party and get the internet code. I can also say that the cruise left me very inspired and during the last few days I found myself coming up with a plot idea I really like the sound of and some characters I think might come back to nag at me. It’s only a standalone novel but with a hint of the paranormal and more than a little romance it should make for some fun writing. At the least it’s worth considering going on another cruise to see if I can inspire a sequel or two for it, because of course, any excuse for another cruise. There’s only 2 and a bit weeks to go until Sherdan’s Country is available in ebook format. With Utopia established but no longer under his control Sherdan finds himself with no where to go. Wanted dead by the British government and the new leader of Utopia, he must find a way to take back what’s rightfully his, but even his normal allies are wary of getting involved in this fight. Sherdan’s Country is the third instalment in the Sherdan series and continues the roller-coaster ride of emotions and suspense as the super-humans Sherdan has created fight for independence and freedom. The book will go live on October 24th at 1 minute past 12 in the morning PST which is just after 8am in the UK. If you’d like to pre-order the book and get it sent straight to your kindle, you can do so here. At the moment that’s the only type you can pre-order on but it should be evailable eventually on Apple, Nook and Kobo. I picked up a copy of this romance novel when I noticed it was free on Amazon and offered to review it for the author. 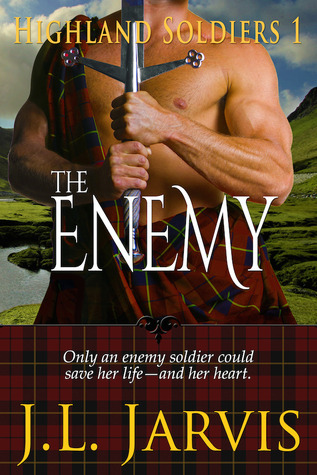 As the cover suggests this is a pretty typical Highlander romance story. Normally I find romances a little difficult to read as I want more to the plot than a lot offer but I can’t say that was a problem with this novel. The plot took from page 1 and kept going right to the end. If anything I felt a little overwhelmed sometimes with how much was going on around the main couple. I adored Mari and Callum as well as most of the rest of the characters (I don’t think I was meant to like a few of them) and routed for them throught the story. I almost cried at several points during the book but I can’t say why because that would spoil the plot. All in all a brilliant romance with plenty of action, strife and emotion to keep you turning the page. I’ll definitely read more from this author.